We are dead in the water right now... I was hoping it was as easy as setting up 3 ODBC DSN's and then my other apps could connect. Can you help us with how to get this setup without needing to have the company file manually opened by someone? We want this to work automatically in the back end and have to switch between the 3 company files on the fly so it's not practical to have a user open the company file manually. 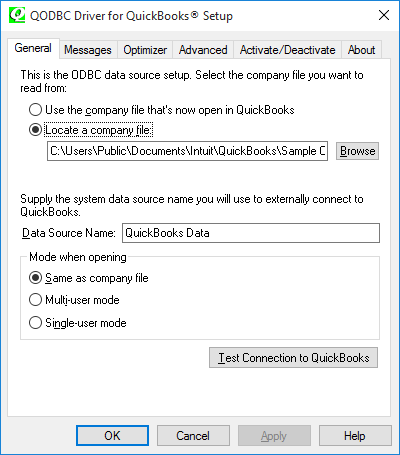 You can copy QuickBooks company file path from QuickBooks UI & paste it to QODBC Setup Screen company file path configuration. You will get this error when the company file is open in QuickBooks. So you need to close company file from QuickBooks & try again. Please refer How to create or configure a QODBC DSN for setting up 3 ODBC DSN's.